You’re born. You walk the world holding mom and dad’s hand, listening to their every word, and hoping to do right by them when the time comes. They’re great parents. They love you. You love them. You spend the first half of your life exceeding by their good example. Then you meet a partner who your parents don’t understand. This new person isn’t good for you, kid. They’ll lead you down a dark path. Mom and dad can’t explain their distrust; they’re just barking orders. Suddenly, your eyes are open to a whole new world, and the old world you’ve been traveling is transformed into a horrendous history of missteps. On his tenth birthday, Hellboy’s father got him a gun and pushed him into the darkest of woods to slay creatures that looked very much like him. Those things that go bump in the night are evil, son. You kill them before they kill us. And then what? You kill the thing under your bed. And then what? You kill the monster in your closet? And then what? You kill the thing at the window. And then what? Uh…there’s always another beast to slaughter. Neil Marshall’s 2019 reboot rips the best pages from Mike Mignola’s comic book and offers a trashy, gory pulp adventure tour through European folklore. He pits the titular paranormal investigator against vampiric luchadors, profane Scottish pig men, jaguar gods, and blood queens. He’s the best there is at what he does: smashing those that look more like him than dear ol’ foster father. When Hellboy (David Harbour) is tasked with demolishing the witch goddess Nimue (Milla Jovovich) before she returns humanity to the bottom of the fairy tale food chain, he is forced to confront the motivations of all the bedtime nightmares he once so easily murdered under parental and governmental sanction. If you were unlucky enough to be born a troll and forced to live in the invisible sections of this Earth so as not to upset the appetites of humans you’d be pretty bitter too. Nimue introduces monstrous empathy into Hellboy, and we should all take notice. After snapping Merlin (Brian Gleeson) from his shallow grave, Hellboy learns the horrific truth behind his lineage. His name is Anung Un Rama, and he was born to reign over creation. Yes, his father was an archdemon whose go-to flirtatious form was an enormous goat surrounded in a fire fur coat. His mother, however, was a human witch and a direct ancestor to King Arthur. Merlin presents Excalibur to Hellboy, but he refuses to pull it from the stone because of an apocalyptic vision in which he rides a dragon over the cities of Hell and descends in bloody fashion through hordes of ravaging souls. Rejected, Merlin fades to dust. Hellboy leaves the holy ground and marches his way to the London cathedral where the Blood Queen will make her last stand. Gruagach (Stephen Graham), the malicious infant-thieving fairy that Hellboy shamed back in the 90s, confronts the B.P.R.D. agents who would do the lady harm. His pig body has been amped to preposterous size, and he happily pulverizes Hellboy. British M-11 agent Benjamin Daimio (Daniel Dae Kim) decides to stop holding back his personal monster with drugs and lets his body be inhabited by the jaguar-spirit. Hellboy and Daimio are unable to overtake Gruagach. Nimue still has needs for her hell king, so she rewards her henchman by shrinking him into a little piglet before exploding him in a mist of blood. She opens up the floor of the cathedral where King Arthur’s tomb is discovered. She reveals an imprisoned Professor Brutttenholm (Ian McShane), slits his throat, and angers Hellboy to the point where he finally yanks Excalibur from the stone. With blade in hand, Hellboy’s horns grow unrestrained from his skull, a crown of fire sits between them, and Excalibur ignites. The streets of London open up, and a horde of demons spill forth slicing, splicing, and dicing every human they meet. Just when you think you’ve seen every way in which a body can be mutilated (shish kabob human socks!! ), Hellboy rejects Nimue’s offer to rule Earth as King and Queen of the monster-folk. He whips Excalibur through her neck and drops her frustrated severed head through a crack in the floor sending her to burn forever in hell. The demons retreat from whence they came. Six months later, Daimio and spirit medium Alice (Sasha Lane) have joined up with the B.P.R.D and are storming a terrorist complex in Serbia with Hellboy. They brutalize a number of faceless goons before coming across a storage tank labeled, “Ichthyo Sapien. April 14, 1865” (the date of Abraham Lincoln’s assassination). The camera pushes in on the milky blue liquid within, and a webbed hand slaps against the glass. 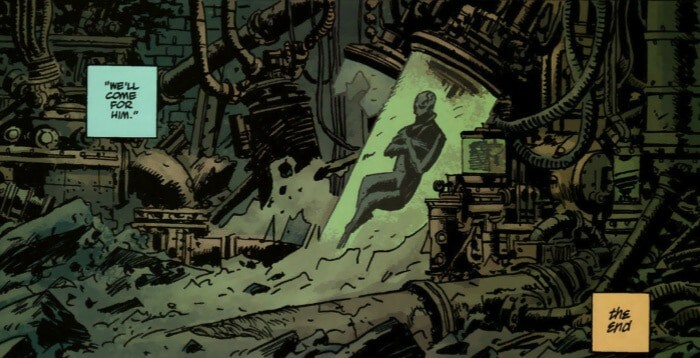 Ladies and gentlemen, meet Hellboy’s future BFF Abe Sapien. The movie cuts to black, we sit through the first batch of credits, and the iris opens again on a nighttime cemetery. Hellboy is drunk atop Professor Brutttenholm’s grave, draining a bottle of brown liquid and slobbering his sorrows to whatever spirits are listening. Before he can fall completely into a wallow, the ghost of Lobster Johnson (Thomas Haden Church) appears to deliver a pep talk. The World War II pulp hero can’t stand to see his 21st Century equivalent wallowing in misery. While Hellboy is a little starstruck, Johnson reveals his famous Claw brand to his fan and tells him to get off his duff and get back to work. The specter passes through Hellboy’s body and wanders off into the night. Bruttenholm would not want to see his son in this state, so Hellboy shakes free from his melancholia with a joyous bellow of “I Love You, Lobster Johnson!! !” The Lobster turns and nods his approval. In the second post-credits scene, Baba Yaga the Russian witch sits at her table inside the chicken leg hut. She’s addressing an offscreen figure. Hellboy promised his eye to her for the one he took years ago but failed to deliver on that after banishing Nimue’s head to hell. She tells the mysterious visitor that she’ll allow him to finally die if he can bring Hellboy’s right eye to her. The end. So, who was sitting across from the Baba Yaga? There are a couple of potential characters from Mignola’s comic that spring to mind. Of course, there are probably a dozen undead others who could fit the bill as well. Earlier in the film, we witnessed Hellboy’s rebirth on Earth via a flashback. Rasputin, the mad monk, working with the Nazis summoned baby Hellboy to the British isle of East Bromwich. Before he could take the child under his custody, Lobster Johnson and his allied forces blast the sorcerer to oblivion. Rasputin has a reputation as an unkillable individual. History says that he was once beaten, shot, stabbed, and poisoned and refused to remain in the ground. In the context of the comics, after the events of East Bromwich, Rasputin drifted into a meditative state where he communed with the Ogdru Jahad, the seven gods of chaos prophesized to bring a biblical climax. The Baba Yaga could be conversing with the mad monk, promising him an end to his long-suffering failures. However, Rasputin would never wish for death until he achieved the revelatory wishes of his masters. That means Baba Yaga’s houseguest could only be Koschei The Deathless. First appearing in the mini-series Darkness Calls, the Slavic nobleman made a pact with the Baba Yaga to kill Hellboy if she could end his curse of life. Over the course of several issues, Koschei and Hellboy trade blows, but the conflict comes to an end when neither combatant can kill the other. The personification of Death explains to the Baba Yaga that if she wants Hellboy’s eye, he must give it to her freely for he is as unmovable and unkillable as Koschei. You’ll have to read The Storm and The Fury to learn how that all eventually gets resolved. Beneath its copious amounts of profanity and CG blood, Hellboy challenges the narrative forced upon us by our elders. We don’t choose the family we’re born into. Hellboy towed the company line for decades, punching goblins and ghouls, kicking pigs when they’re down, and yanking eyeballs from witches. He was told they wanted our end, but maybe they just wanted to shop at the same Starbucks we all do rather than drink the refuse that rolls downhill. An eye for an eye justice system breeds endless torment and sequels…box office depending.